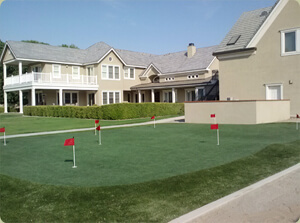 Our artificial grass is the perfect fit for golf enthusiasts and homeowners alike in Bakersfield. Our synthetic grass products require little-to-no maintenance to retain their perfect look and feel year-round. Practice your short game when the mood strikes by simply walking out the back door or just enjoy the beauty of a lush, green lawn. If you love the game of golf or are just looking to upgrade your outdoor space, call Southwest Greens today! Southwest Greens creates all of our products using the finest artificial turf the industry has to offer. Our artificial grass is made with top best quality 7600 denier polypropylene synthetic grass fibers that provide durable, lifelike quality. We are proud to offer residents of Bakersfield artificial grass that offers an ultra-realistic look and feel, as well as the highest level of play for our golf enthusiasts. We are proud to offer residents of Bakersfield golf greens that offer an ultra-realistic look and the highest level of play. Did you know that 25 top PGA professionals not only endorse our products, but they also use our putting greens at home? We can turn any backyard into a championship-level golf practice area that compliments your landscape design. Our backyard and indoor golf putting greens are so realistic and play so much like natural grass that you'll have a hard time telling the difference. We invite you to join the many homeowners and golf enthusiasts in Central California who have made our synthetic grass the pride of their backyards. Artificial grass installation is a timely and easy process that can be completed in as little as one week. We have an entire team of synthetic golf grass experts ready to design your dream putting green today. Southwest Greens could not be more excited to offer you the opportunity to have your very own practice green. Beautify your Bakersfield home with top-of-the-line artificial grass. Call us today at (661) 834-7888 to learn more about our synthetic turf products and bring a beautiful, natural look to your backyard.